Spotlight: EoP Infusion Pump - Perelandra Ltd.
We'd like to remind you about the EoP Infusion Pump or if you're new to Perelandra, introduce you to it! This little bottle radiates strong support when you're striving to stay level-headed and make difficult decisions. When you're at the tipping point, the EoP Infusion Pump helps you tip toward balance. EoP infusion pump is also useful when you travel, especially if it takes you into a different environment with different food and water than what you are used to. Use Essence of Perelandra anytime and anywhere you wish to provide a unique foundation of balance, stability, strength and support. 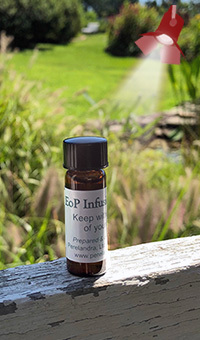 Take 10 drops of EoP orally for your overall health and well-being. You may give 10 drops to a child or infant for their health and well-being.